ghWhen I first started collectiong carnivorous plants I kept them in containers that were placed in trays to hold water. After a couple years of growing and propagating them things were getting out of hand. I decided to build a bog garden to make growing them easier and to display them at their best. That was many years ago and these are the only pictures I have. After a couple years the bog garden had filled in nicely and looked beautiful. I don’t have pictures of the mature bog garden but these pictures will give you an idea of how it was built. I no longer have the bog garden but am thinking seriously about building another one. 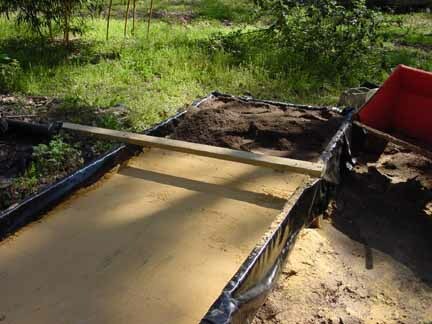 The basic structure is 12 inches deep (2- 2×6 boards) with a rubber membrane liner. This is the same type liner used in water gardens. I placed 6 inches of sand in first. Bog garden with first six inches of sand. The sand was covered with a 6 inch layer of a sand and peat mix. 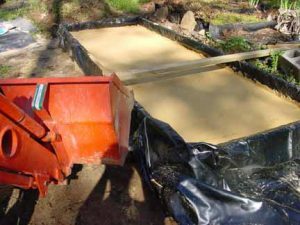 I used the tractor bucket to mix the sand and peat. You can see I’ve just started filling here. 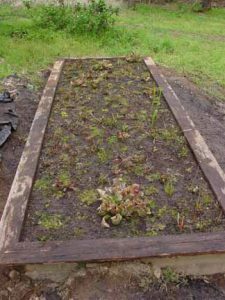 When the bog garden was completely filled with the sand and peat mix I started planting. 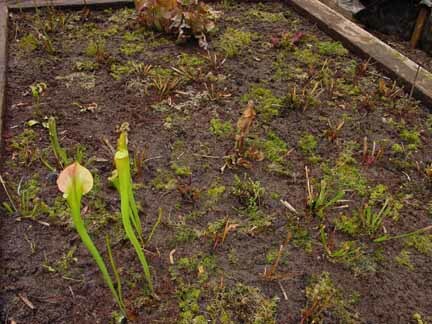 In the picture below I’ve planted most of the carnivorous plants along with live sphagnum moss. A close up of the garden after the plants have started to grow. The tall pitchers in the lower left are a variety of Sarracenia called “Copper Top”. The garden turned out great and looked amazing after the first year, but I made a mistake. I planted live sphagnum throughout the garden. At first it looked nice but after a couple of years it had completely taken over. Many of the small plants were covered up and lost. I tried removing as much as I could but it would only take a few months to replenish. Next time I will leave out the sphagnum moss.